I’m not someone that plans things, I love to go with the flow and follow the opportunities as they arise. So when someone told me that the sunset was celebrated every night down in Key West…I got sold on the idea of going down, I mean could there be anything more worth celebrating than the celestial body that provides life to us on earth?. 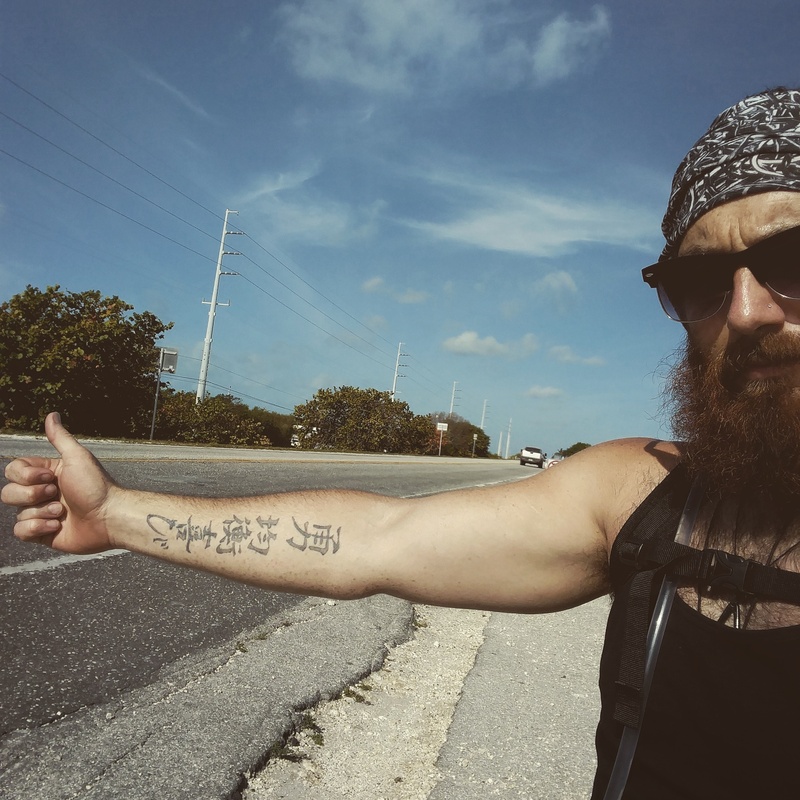 I planned to Hitchhike down to Key West from Miami, Then someone told me the day before I was going to hitchhike down that there is a Cycle path pretty much the whole way in the Keys…well why not push down I thought. 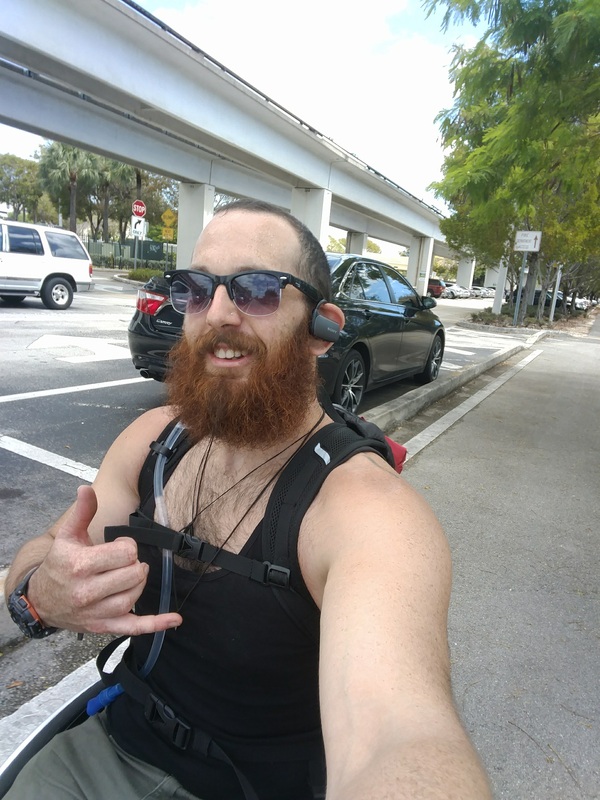 I love the sun, I love adventure and most of all I love to push myself physically not only because I know the wheelchair wont slow me down..But that excercise is the perfect anti-depressant, the biggest high you will get is from pushing your body and mind past what you think it might be capable of. To get to a point where you have to talk to your body to keep your body moving, with sweat running into your eyes and the burn of your muscles, each breath valued…I live for that feeling. If your ever struggling with anything in life..go for a run, swim, push, bike or anything where you can exhaust yourself physically and bring you back to your simplist appreciations. Like your breath, your heartbeat and you have pushed so hard that you only have enough energy to be in the moment, the valuable energy that you have at the moment is spent on the processes of the now and only positivity can fill your mind. I hadn’t planned anything, I didn’t think of what I should pack, where I should stay or how or where the path was. I just literally left where I had been staying, went and got a coffee and started pushing..hopefully in the right direction. Stopping off to pump up my tyres at a bike shop I started on the path which was slowly turning from Miami city to a seemingly endless backroad. I loved the physical push, it was hot and I knew I was getting burnt so had to stop off and buy a hat. 20 or so miles later after enduring the sun, drinking all the water from my camelback, sticky and burnt from the sun I found a Hostel which had someone had recommended and thankfully they had room because I needed to tend to my burns with some Aloe vera from the hostel garden and refuel for tomorrow. 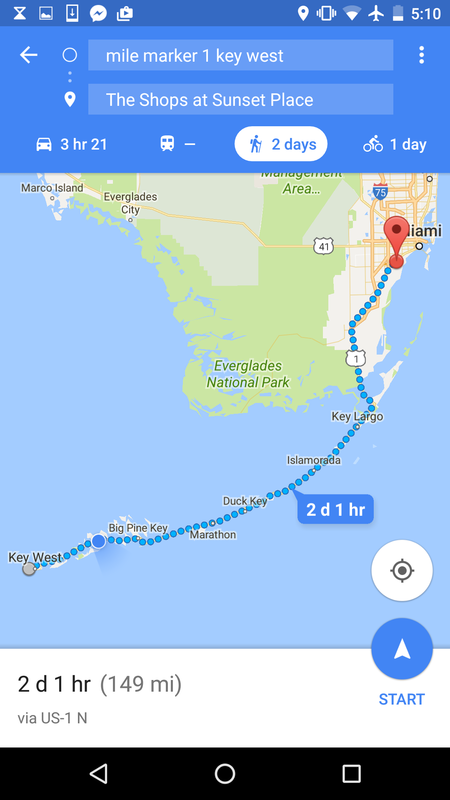 Having been told there was no space on the road inbetween Florida City and Key Largo I decided that I would bus to Key Largo ( the start of the florida keys) which was about 20 miles. Another day of extreme sun but I wore a t-shirt and used alot of sunblock to try recover today, yesterday meant that I had to manage myself today with the sun. I pushed, and pushed..I started at about 9 am and stopped around 1 to have lunch, and then kept pushing. Around the 20 mile mark I started to look for places to stay the night, preferably a hostel or something cheap..this was around 3pm. No such luck and I got a bit off the maintrack and was now wheeling on the road, thumb out to hitch a ride back to the main road where there was a path. getting a ride with Rocky, Liinci and there new born daughter and hungout with them for a little while down at a beach and them showing me some local spots that might not be so busy with this crazy traffic of people where I could possibly sneak in and sleep on the beach for the night. It was around 4 when they dropped me off at a beach place but it was busy and I still felt like pushing. So I pushed, kept getting further and it kept getting later until it was dark and I was still pushing and hadn’t found somewhere to stay for the night, I asked around but everywhere was booked out…I should have picked a weekend that wasn’t spring break and also easter weekend haha. Pushing over the bridges in the day was ok, I was close to the cars but I knew they could see me but I came to a bridge about 10 pm and I had luckily accidently packed my headtorch so I had that on while I was pushing otherwise I would have wheeled straight into the ocean probably. This was bridge with a big arc to allow boats to go under and I asked people that were fishing if I could catch a ride over, no response. I tried hitchhiking over, no response…so I decided I should wait until the early hours of the morning when traffic died down, at this stage I was pretty keen on having a rest and sleeping but there was no where…The grass was full of beady eyed spiders, so that was out. I wheeled down a bank, unknowingly through some cactus plants, and chilled in the bush for some sleep in my chair. I tried to sleep but I kept hearing sounds and wasn’t sure what was hiding in the bush so out of desperation of trying to find somewhere to rest I pushed over this bridge with my headlamp facing backwards and pushed as fast as I could being prepared to dodge cars and to be yelled at. I made it, and kept pushing it was about 1 am when I started singing repeatly because there were no people around and this endless path was getting making me insane probably ” I push for days and days” I kept singing that for some reason. About 2 am I decided to sleep on this pedestrian bridge that runs along the main car bridge, amazingly there were some people fishing in the dark and a couple of what looked like homeless people..jumped out of my chair, put my warm jacket on, used my backpack as a pillow and lay down to try and sleep under the moon in this concrete island in the middle of the ocean with the wind blowing. After a couple hours sleep I kept pushing, around 5 am and fell asleep on the steps to a motel waiting for it to open at 8am..I waited and then was told there was no room. My eyes were popping out of my head and my body was feeling like it had just pushed 50 miles which I did. I saw a bus go by and was so tired and hungry, and thought to myself ” why would I choose easter weekend and also a spring break weekend” thats what happens when you just go, I can live with that. I decided to catch up bus back up to Edwards in Miami who was awesome and let me stay, so I could have a shower and wash the 50 miles of sweat off, eat and sleep and continue in a couple of days when it wasn’t easter weekend. Wow watching the bus drive for a couple of hours and seeing how far I pushed was cool. It didn’t seem that far because I wasn’t focused on the destination, I just kept pushing. After I was rested I realised how much I missed being out on my own, in the unknown. I caught a bus back down to marathon which was where I had caught the bus from to come back up. Meeting up with Marta who was a friend through a friend, and I always love meeting people especially when there is a common connection. I stayed in a hostel there, which I sort of snuck into. Up before 8am to start pushing again, pushing about 32 miles and having to try to hitchhike across a 7 mile long bridge before I found somewhere to stay. A campsite, I tried to talk the price down seeing as I was getting a tent site but was going to sleep outside. Always appreciating a place to shower and charge my phone, have a place to chill and refuel. That night I got out of my chair and slept on a park bench under the stars, what a beautiful night…except for the millions of mosquitos, I slept wearing my jacket backwards with the hood over the front of my face and my hands tucked in…genius, it stopped the bites anyway, mabe not something to do if you want to look cool though. I knew I would make it to to the most southern point of the USA today, getting up early and pushing along the road, over bridges and through towns. 8 am to about 12 I was pushing today, not as long as the other days. 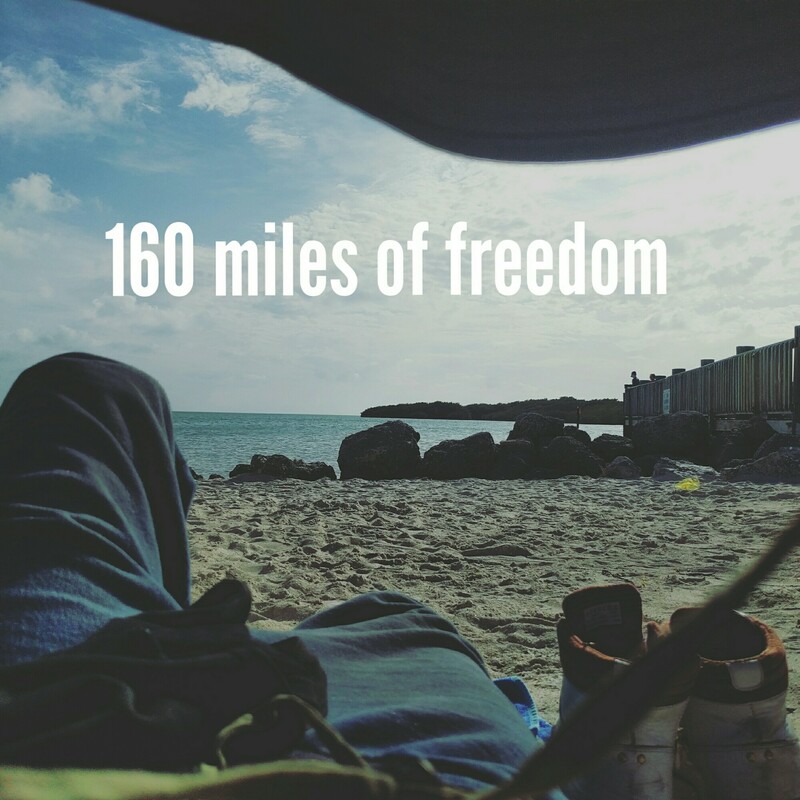 I had come 120 or so miles…now for the last stretch. I really did enjoy the sun, and having my music in. Along the way in stores and people on the street would come up and say that they saw me wheeling along the road or where ever, there was pretty much no one on this path down the keys so I stuck out more than I usually would. Finally I made it, I was so sweaty and my clothes were drenched so I had to find showers. I found a community pool, on a rooftop which was awesome. Literally only locals there..I got to cool down and refresh so that I could go celebrate the sunset with the rest of the tourists of Key west. After going in to one of the 300 bars in Key West to listen to some music, getting mistaken for a homeless man (again) and catching up with Aramis who I had organised to couchsurf on his houseboat for the night, I went down to Mallory sqauare..watched the performers and looked out on to the ocean at the sunset and said thank you. Thank you for teaching me that I dont need much, that things will work out even if you have to sleep outside. That you can journey as long and as far as you like if you appreciate the journey, that the destination is just a milestone of a start, the start of a bigger journey. You are inspiring. Enjoy your travels. It looks like we know the same people. I know Robbie and Annette. I also know Danny Ray. I met you through his site. In response to what you wrote, I almost became a travel blogger but I switched to blogging about blogging tips. Maybe you can check out my blog if you need any blogging tips. I also host blog parties like Danny. Wow! Bravo! Best thing I have read-a and reread! Where is your next push? Courageous ride ! Thanks for sharing – you made me smile. I believe you are a great inspiration to many. I nominated you for the Versatile Blogger Award and wanted to send a little love and recognition your way. Your words need to be heard by more but there is no pressure to participate if this is not your thing. Just didn’t want to pass you up. Keep rollin…. Thank you so much, I’ll have to check out what the versatile blogger award is…do you have a link to more information? :). mettre un proces a quouuu&rsqle;qn sans lui avoir demander de retirer un lien, ce n’est pas la version civilisÃ©e du poing dans la gueule.Quand en plus on demande 30 000â‚¬, a un type qui n’a pas un rond on est un gros enfoirÃ©.Et il est allÃ© aux Ã©tats-unis pour rÃ©ussir… So what??? Blogger has been &#3of9;f' lately for sure!! This is just stunning. Your album is going to be just as stunning from what we see here. Absolutely gorgeous. Love all the flowers, bling – all of it! Thanks for joining us at Lasting Memories this week!! After a hard day playing basketball 🏀🏀 looking out from our ballin' room ...muscles hurt from leaving it all out there 💯. Wicked job #adelaidethunder. 2019 NWBL season here I come. Super stoked to have been nominated for this, although I didn't win because Canterbury is full of amazing athletes 😍 and congrats @wheelynz , well deserved brother. Sport has been an amazing outlet for focus and drive in my life, sometimes you win things from doing something you love..what a bonus.